Regenerative Therapies are an exciting new field of treatment modalities that utilize the body’s own natural healing capabilities. Stem cell treatments are the most obvious examples of this, and they have been incorporated into equine practice for several years. These and other examples will be listed below. Stem Cells are pluripotent cells that can develop into different types of tissue depending on where they are deposited. They are harvested and Vet-Stem Logocultured from either fat or bone marrow, and then returned to your veterinarian for direct injection into the damaged tissue. ACell Extracellular Matrix provides the temporary scaffold necessary to support the cells required for healing of damaged tissue. It also recruits those healing elements needed for tissue repair and encourages them to move to the needed location. Platelet Rich Plasma (PRP) is harvested from the horse’s own blood and then injected into or around the damaged tissue. When these concentrated PRP Cellsplatelet cells come in contact with the tissue, they release various ‘growth factors’ that stimulate recruitment of the cells and materials needed to heal the injury. IRAP (Interleukin-1 Receptor antagonist Protein) is also harvested from the horse’s own blood. It is incubated with special glass beads for 24 hours IRAP Incubatorto produce the protein, and then it is injected back into the horse’s arthritic joints. It is not truly a regenerative therapy but it is mentioned here since it is concentrating the body’s own natural healing capabilities, much like the other therapies described here. The primary effect for this treatment is a reduction of inflammation and pain. Shock Wave Therapy or more properly, Extracorporeal Shock Wave Therapy (ESWT) has been used in humans and horses for musculoskeletal EWST VersaTronconditions for years. Originally these pressure waves were used just to break up kidney stones in humans. ESWT is now finding wide use for lameness applications in horses. The exact mechanism of action is incompletely understood, but the blood supply is increased, agents which improve healing are recruited and pain relief is often immediate. Therapy is non-invasive and rapidly completed. Multiple treatments are often required. Tildren is a drug which has been tested but not released for commercial distribution in the United States. It is legal to use, but must be Tildren vialsobtained from overseas sources. The mechanism of action involves reducing the action of the cells that absorb bone (osteoclasts) and allowing the cells that build bone (osteoblasts) to more effectively function. 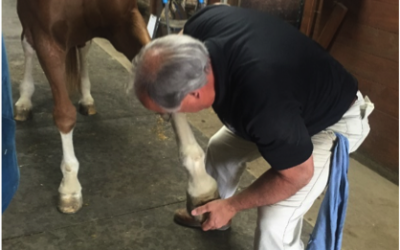 The initial application revolved primarily around navicular disease, but many other uses are now being explored. This is included as a regenerative therapy because it utilizes the body’s healing potential in a slightly different way. These half dozen examples of regenerative therapies are likely to be followed by other even more Wally and Allyadvanced treatments in coming years. As part of the human genome project, the horse’s genome has also been completely mapped. This may allow gene expression therapy which will further expand our options. There are also several current experimental approaches which involve a systemic approach to such things as stem cell recruitment. This means that the product may not need to be injected directly into the damaged tissue, but may be given almost like a vaccine. In each of these examples, a diagnosis needs to precede the treatment. An inaccurate diagnosis will lead to ineffective treatment in most cases. There is no substitute for a good lameness exam and appropriate nerve block, radiographs, ultrasound or other imaging evaluations. Consult your veterinarian and then consider helping your horse heal himself through regenerative therapies.